These books will help you find the pot of gold at the end of the rainbow you're seeing. Well, maybe. Find these restocking at Leila Library. Who's ready for St. Patrick's Day?! Dragold's Den returns tomorrow at midnight Egg Cave Time. See you then! Congratulations to @umbregrl and @leomaris and @sylviana, the winners of drawing 1 for March 2019's Cash Shop Creature Lottery! A Bolgfir has been added to each of your accounts. Daily sign in rewards were messed up over the last couple of days due to the change from Daylight Savings Time. (It always messes something up, right?!) Long story short: it has been fixed and daily sign in rewards beginning March 14 will be correct again. If you've ever wondered what St. Patrick might've had as far as cupcakes go... look no further! Here are some brand-new cupcakes that are now restocking at the Bakery. Dragold's Den returns March 17 on St. Patrick's Day. It'll go through the end of the month. Stay tuned for more updates. The following Cash Shop Travels will be retiring from the Cash Shop on Sunday, March 10 at the end of the day. Get yours before they're gone. It's crazy to think how spring is almost here! These new St. Patrick's Day-themed ice creams are now restocking at Finley's Flavors. It's time to pay him a visit because of the warmer weather, right? These brand-new clover- and rainbow-themed Cash Shop Travels are now available just in time for the upcoming St. Patrick's Day celebrations. Get yours today! Here are some new Trinket Travels for more regular Egg Cave species! There's now more options to pair. Welcome to March! 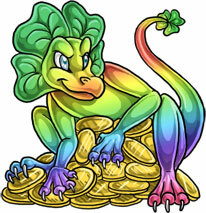 This is the month of four-leaf clovers, leprechauns, and Dragold's Den (which returns around St. Patrick's Day)! Oh, and we can't forget the pots of gold! These Cave monthlies will be available through the end of the month! Find them there for a limited time. This is the Koluk and the Stobow. It's not complete without some new creatures arriving at the Cash Shop Park, too. Say hello to the Bolgfir and Manekii. Many thanks to @achimenes for their submission for the Manekii. The Dragfer is available in the Cave once again for the month of March (it is a seasonal creature). These brand-new Texu Trinket Travels are now restocking. Dragold's Den returns around St. Patrick's Day. Stay tuned!